Legend says that the first of the Sea Kings came from across the ocean, their ships bright in the rising sun. As time has passed, some cities have risen and some have fallen, but there have always been the Sea Kings at the eastern edge of the Known World, it seems. Dawnkeep: The River City.Sacred to Pelor, where the mouth of the Great River empties into the Sunrise Deeps. Lots of agriculture around it, growing amaranth grain, and where grain-barges from the Five Rivers Basin come to sell their food wares. Everwatch: City of the Great Lighthouse. known for its scholars, sacred to Ioun, home of the Oracle of Ioun. Fortune’s Keep: City of Merchants. sacred to Avandra, major trading center. Whitewave: City of Wine. whose patron goddess is Sehanine. Holds full moon festivals every month, with a carnivalé like atmosphere. Place for honeymoons for those who can afford it. It is also the provider for the majority of the lumber that comes to the Cities of the Sea Kings. Not all places in the Known East are claimed by the Sea Kings. Some such places are the homes of those who are allied with the Sea Kings, or places of dark reputation that none dare approach. Dragon Isles: ancestral home of the dragonborn, where they now live in small settlements, fearful of nearing the old ruined cities that dot their isles. Roselight Isle: where Namarís Yltánah appears at dawn on solstices and equinoxes, disappearing at sunset. Sacred to Corellon. Dragonborn: The dragonborn are plentiful in the Cities of the Sea Kings, hailing as they do from the Dragon Isles, in the eastern reaches of the Sunrise Deeps. Considered excellent mercenaries and soldiers for their strength and sense of honor, it is not uncommon to find dragonborn bodyguards and troops serving those who can afford their services. The city of Fortune's Keep also has a sizeable population of dragonborn, such that nearly a third of the city's guard are dragonborn. Dwarf: Most dwarves in the Cities of the Sea Kings dwell in the city of Steelhame, whose patron god is Moradin. Their skill at smithing is well-respected there. Though the Steelhame dwarves do honor the Steel Lord, the Sea King of Steelhame, they do not acknowledge him as their leige. They recognize only the Hammer Thane in the far off Anvil Vale as their ruler, and defer to his representative in Steelhame, the Elder known as Brunethar. Eladrin: The eladrin of the Cities of the Sea Kings almost invariably hail from Namarís Yltánah, the city that appears only during the solstices and equinoxes on Roselight Isle. At such times, ships of white wood and milky crystal set sail from the City of Roses, carrying eladrin interested in exploring the Known World, and those ships that have been away wait off-shore for the city to appear as well, carrying those eladrin who are ready to return to their home. Elf: There are no native populations of elves in the Cities of the Sea Kings — all who find their way here come either from Daggerwood or even further from the forest clans outside of Anvil Vale. Still, there are elves aplenty, many of whom wish to see the ocean. A few who visit here settle in, finding the deep blue to their great liking, and settling in to the protection of the Sea Kings. Half-Elf: Like elves, half-elves tend to come to the Cities of the Sea Kings from Daggerwood. They receive a warm reception here, as their reputation as skilled diplomats and ambassadors put them in great stead with the courts of the Sea Kings. Halfling: Halflings call the Great River itself home, and tend to journey its length in small boat caravans of up to two dozen large vessels at a time. The arrival of any Halfling caravan to a settlement is usually a carnivale-like time, as the Halflings seek to sell the goods they’ve brought with them, and make their livings as entertainers, performers and con artists. Along the Great River, however, small settlements of Halflings can be found occasionally, made up of those who tired of the danger of travel and have settled in to a more sedate life. Such settlements — called moorhomes because they always feature ample moorings for Halfling vessels — are usually small, but always filled with laughter and merriment. Human: It is said that humanity came to the Known World over the Sunrise Deeps. 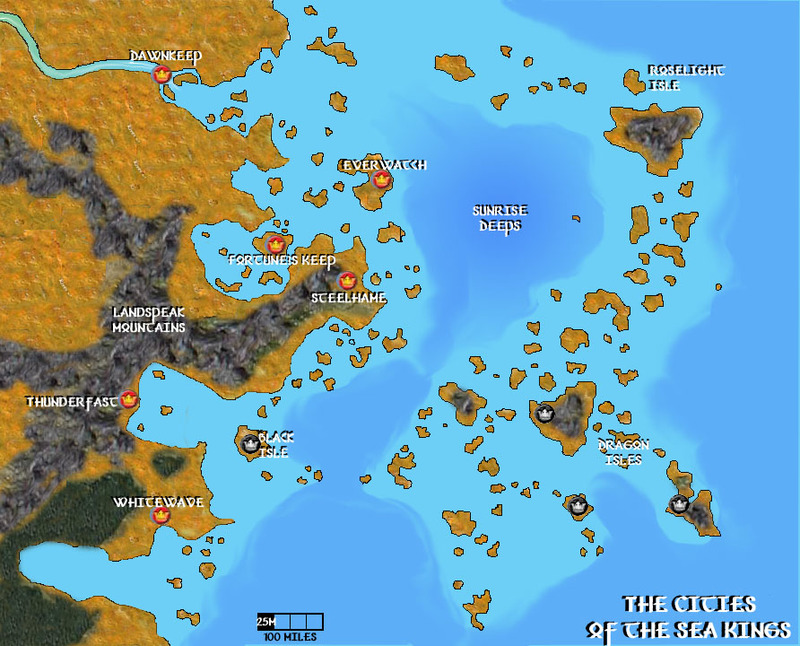 All the Sea Kings are human, and though humans can be found all through the Known World, most of the other races consider the Cities of the Sea Kings to be their natural home. Tiefling: Anywhere humans are found, there are also found tieflings, who other races claim came with humans from the east in the long-ago. Because of the suspicion they engender, they are usually found only in large cities, like those of the Cities of the Sea Kings. They are frequently forced into ghetto-like living conditions in those cities; the primary exception to this living standard is in the city of Everwatch, home to House Grimmil, a noble family of tieflings. Avandra: The patron goddess of the Great River Halflings, Avandra also sees plenty of worship in all the Cities of the Sea Kings by the captains and crews of the great trading vessels there, though she is most-revered in the city of Fortune’s Keep, home to her largest temple in the Known World. Bahamut: Bahamut is worshipped primarily in the Cities of the Sea King, thanks to the honor the Sea Kings give him as their patron lord. Additionally, the proximity of the dragonborn, who revere Bahamut as their spiritual father, keep Bahamut in the eye of the sea-going peoples. The largest known temple to Bahamut is the Venerable Lair, a massive mountain-top open-air aerie in the middle of the Dragon Isles, tended by an order of silent dragonborn mystics. Corellon: Corellon’s worship is best-known among the eladrin. His only known actual temple is the House of the Star in Namarís Yltánah, hands-down the largest of Corellon in the Known World. Erathis: Though many of the Cities of the Sea Kings boast a patron god, Erathis is considered the Divine Mother of the Cities of the Sea Kings as a whole, boasting shrines and statues in important places in the coastal cities. Ioun: Worshipped throughout the Known World, Ioun is revered by all the races. In the largest cities, his followers have built his library-temples, the largest of which is Everwatch, the city of the Great Lighthouse. There, the Oracle of Ioun receives visitors who seek knowledge of their futures and fates in the Adytum of Lore. Kord: The Cities of the Sun know Kord in his storm god aspect, and every ship’s journey begins with a prayer to him for peaceful skies and strong winds. He is also the patron of Thunderfast, who hold his temple, the High Halls of the Storm, as the only proper place to hire mercenaries or other fighting men. Melora: The Cities of the Sea Kings focus on Melora's oceanic aspect. Though she is the patron goddess of none of these cities, she is worshipped in all of them with a small ocean-side temple. More importantly, though, the figurehead of any ship is considered a proper shrine to Melora if a new string of seashells is roped around its neck at the onset of a new journey. Moradin: Moradin is worshipped in most human mining communities, and in any places where many smiths congregate. The great city of smiths, Steelhame in the Cities of the Sea Kings, claims Moradin as its patron. Pelor: Pelor is the lord of the sun, and patron of the city of Dawnkeep. His largest temple is the great glass edifice known as the Sun King’s Throne, found in that city. The Raven Queen: The Queen of Winter is rarely worshipped and often propitiated. Her faithful perform a valuable service, however, interring the dead and guarding against the undead. There was once a City of the Sea Kings dedicated to the Raven Queen, a great funereal city where the dead of the Cities were brought by black-draped barges to be buried, but a terrible uprising of the undead destroyed the city. The Black Isle now sits, often shrouded in mist, with the great Winter Temple standing tall and dark above the city. Sehanine: The moon goddess Sehanine is worshipped all throughout the Known World by lovers and scoundrels alike. Her temple in Whitewave, the city that claims her as its patron goddess, is quite impressive. This page was last modified 22:01, 26 June 2008.